Inside, we carry a good range of trade and designer paints, assorted decorating tools and accessories, and as well as plenty of wallpaper pattern books you’ll find a large stock of discontinued wallpaper in stock. Enough that customers have been able to do up an entire home at surprisingly low prices. We’ve been in Plympton since 2003 and our loyal customer base continues to grow, thanks to the Brewers product range and the attentive service our team gives to everyone who comes into store for help and advice. 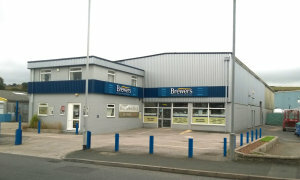 Plymouth Brewers Decorator Centre is technically in Plympton, just on the outskirts of Plymouth. We’re on Galileo Close on the Newnham Industrial Estate, next to PCW Carpets, which sits on the corner of Strode Road. You can easily park and load up in our dedicated parking area. Coming off of Glen Road or the B3416 onto Strode Road, pass Glenside Rise on your left and go under the railway bridge, take the next left onto Galileo Close to find the store on your right. From the Newham Road entrance onto Strode Road, take the first right onto Galileo Close to find the branch on your right.